Acer has gone rampant and unveiled a slew of new device before their expected Computex 2014 debut (starting June 3). Those devices include the Acer Liquid X1, E700, E600, Liquid Jade and Liquid Z200 smartphones, the Liquid Leap smartband and the Iconia 8 tablet. All devices are expected to launch in Q3 of this year. Now the best-equipped smartphone of the bunch is the Acer Liquid X1. It's an octa-core LTE smartphone with a 5.7-incher at the front and Android KitKat on board. The display is uses the Zero Air Gap technology for lower light reflection, higher contrast and brighter images and has an IPS panel of 720p resolution. The smartphone has a 1.7 GHz processor and 2 GB of RAM are embedded into a MediaTek MT6592 SoC. The camera is a 13 MP unit with the impressively-wide f/1.8 aperture, 0.3s autofocus and 1080p video capabilities. The Liquid X1 has 16 gigs of storage expandable through a microSD card (up to 32 additional gigs) and there's a 2,700 mAh battery on board. The Acer Liquid 700 and 600 both have Android KitKat on tap along with microSD card slots for cheap expansion of the storage. The Liquid E700 is the more powerful of the duo. It has a MediaTek MT6582 chipset with a quad-core 1.2 GHz processor, Mali-400 GPU and 2 GB of RAM. 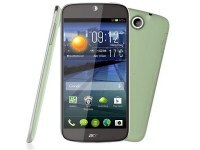 It also supports three SIM cards and is powered by a potent 3,500 mAh battery. The screen of the Liquid E700 is a Zero Air Gap 5" IPS unit of 720p resolution. There's an 8 MP camera with an LED flash on the back as well. 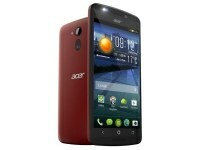 The Acer Liquid E600 has the same size display but of the much lower 480 x 854 pixel resolution. 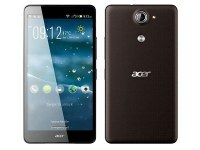 It's powered by a Snapdragon 400 chipset with a quad-core 1.2 GHz processor, the Adreno 305 GPU and 1 GB of RAM. The battery capacity is lower at 2,500 mAh but there's LTE connectivity, which the E700 doesn't offer. We move on to the Acer Liquid Jade smartphone and Liquid Leap smartband, which Acer showed at an event in April but didn't elaborate too much on what they offer. Well now we know the Liquid Jade has a 720p IPS display of 5" diagonal of the same Zero Air Gap variety. There's a 1.3 GHz quad-core processor with 1 GB of RAM embedded on the MediaTek MT6582 SoC. The camera is the same 13 MP wide-aperture, fast-focusing unit of the Liquid X1. Finally the battery is a 2,100 mAh unit. As for the Liquid Leap - it's Acer's first wearable device. 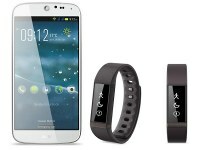 It has a 1" touchscreen display and can do fitness tracking, call and SMS notifications. It will be offered in Moonstone White, Mineral Black, Aquamarine, Fragrant Pink, and Vivid Orange colors and is IPX7 certified for water protection up to a meter for as long as 30 minutes. 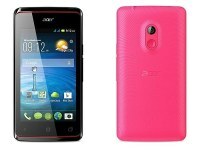 The Acer Liquid Z200 is the simplest of the bunch. 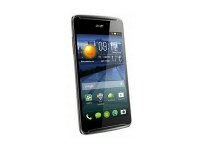 It has a 4" WVGA screen (480 x 800), 1 GHz dual-core processor inside a MediaTek MT6572M chip. There are 512 MB of RAM, 2 MP fixed-focus camera and a 1,300 mAh battery. 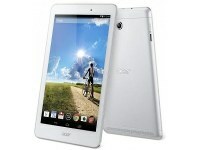 The Acer Iconia 8 tab has an 8" Zero Air Gap display of 1080p resolution, stereo speakers and an Intel Atom Z3745 inside. It runs on Android KitKat with very slight customizations. From the pics, it seem the e700 has stereo speakers too.